THE Dockers headed north for this year’s Community Camp popping in to Badgingarra, Jurien Bay, Leeman and Dongara. 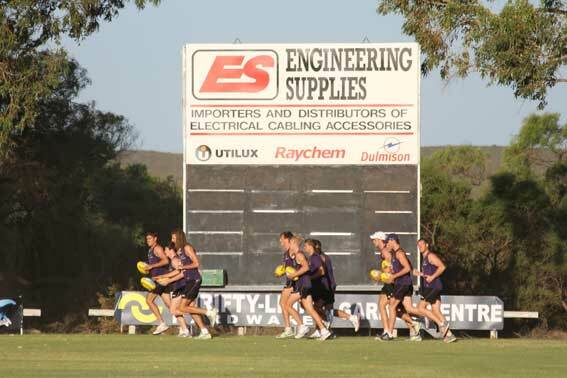 Costa Kastanis captured this photo of a group of players running past the scoreboard at Jurien Bay… we can spot Garrick Ibbotson, Craig Moller, Cameron Suttcliffe, Hayden Schloithe, Stephen Hill, Clancee Pearce, Jack Hannath and Lee Spurr but there are a couple we just can’t make out… we hope a Docker-eyed reader out there can complete the list. When scoreboardpressure visited Jurien Bay there was a B-Grade Central Midlands Coastal Football League going on….